The Union dug a deep hole for itself when it hired George Boardman to be its weekly columnist, as I’ve written before. He’s the poster boy for the newspaper’s declining, aging demographic. Until it dumps George, it won’t grow readership. Not a chance. In fact, George is ignorant about some nationally recognized programs in our own community, insulting its organizers and supporters with his ignorant column. • Monthly tastings of seasonal produce in over 200 classrooms. 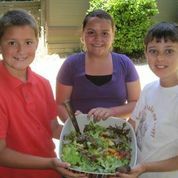 Another example: “The end of the year has arrived for our local schools…..after a wonderful year of learning about growing food, how to cook and eat healthy, fresh food and the importance of caring for our bodies, it was so inspiring to see these Deer Creek students celebrate the end of the year by harvesting a fresh salad from the school garden! Meanwhile, the community and its farm-to-table movement is thriving – and making The Union look more and more irrelevant. The Union has long been a lapdog for our community, promoting the “old boys” network. Keeping the western county small and insular has benefitted the newspaper and the “old boys,” because they can control the message and, in their minds, influence local policymaking. It’s a selfish strategy. The internet is changing this, however. Worse is when The Union tries to be a “watchdog.” It often just doesn’t have the “journalistic chops.” Instead, it falls back on the “don’t argue with people who buy ink by the barrel” mantra, increasingly irrelevant nowadays amid new competition. Nowhere is this more apparent than with The Union’s weekly columnist George Boardman, who epitomizes a small-town journalist “shooting blanks.” He’s become a running joke in some circles around town because like Former Union Columnists such as Russ Steele and George Rebane (known to some locals as the “FUCs”), he’s not interested in the truth, just an ideology. (“Dumb bureaucrats” is one of Boardman’s favorite themes). These “bureaucrats,” by the way, increasingly are asking to meet with The Union’s management to express their displeasure with the newspaper’s ignorant reporting. For whatever reason, The Union’s “stock-in-trade” has become turning its pages over to the uninformed like Boardman, telling the rest of us “what we think we should know.” It’s why The Union’s demographics match its readers — aging and declining. George isn’t just a weekly columnist, either. He’s been a member of “The Union’s advisory board,” supposedly a brain trust for information. Boardman’s blog this morning (promoted in this mornings print pages of The Union) is a case in point. It is titled “Bureaucrats will tell you what they think you should know” and manages to insult a whole slew of them — but without informing us. Memo to Publisher Jim Hemig: What’s the ROI on Boardman? When it comes to the schools, George is upset that the Superintendent or Trustees won’t discuss personnel issues, though it happens to be the law. The Union lost an FOI lawsuit in a related case, costing the district $17,000 to defend. In this instance, the handwriting is on the wall at the school district, but The Union just doesn’t like the answer. The district is struggling with issues such as longterm accreditation and declining enrollment, and it is changing management to achieve that — just like all businesses do, including The Union. Duh. In the issue of the clerk-recorder’s office, Boardman would have been better off to just publish Diaz’ statement regarding a delay in mailing of ballots because of a printing error. It would have been more informative. The Union also has a habit of “interpreting” and getting it wrong. Boardman also is incorrect in alleging a lack of transparency in this issue. I know this firsthand: I had the same brief discussion with the assistant-clerk recorder and got all my questions answered, including the name of the printer. Instead, Boardman ought to be picking on a “bureaucrat” such as El Dorado County Supervisor Ray Nutting, a property rights advocate and tea-party hero who also happens to be on trial for felony charges. A jury is deliberating his fate this week. Nutting faces four felony counts stemming from roughly $70,000 in state grants he was awarded to clear brush on his private property. “The prosecution of the veteran timber rancher, a stout defender of private property rights and a hero to tea party conservatives, is revealing angry divisions within the local Republican Party faithful and deep-rooted antagonisms in a county long known for its bare-knuckled politics,” as the Bee has reported. For its part, The Union is at a crossroads and struggling to find the talent it needs to grow its business in the age of the internet. Editor’s note: I’m often distressed at The Union’s policy for vetting letters to editor, especially during the election season. The one below is a prime example. My comments are in italics. “Having recently moved to California and settled in Grass Valley, I have been eager to get involved in my community and to get to know my elected officials. The ongoing District 3 race for county supervisor has me intrigued, to say the least. “I’m very concerned about Mr. Lamphier’s willingness to take money ($5,000 to be exact) from the developer of the Rincon Del Rio Housing Project, given his elected position. To say that that is a conflict of interest is, in my opinion, a huge understatement. Context: Whoa! The Union, no less, has reported, “the contribution was not timed to coincide with the project approval, which was done in April. The subsequent litigation and settlement negotiations were handled by lawyers, with little or no input from the supervisors.” This needs to be acknowledged somehow. “It appears that Mr. Lamphier can be bought for pennies on the dollar, which leaves me with much doubt as to his ability to be an effective and sound elected official. Context: Wow! Alleging that Lamphier “can be bought for pennies on the dollar” is a red-flag word. Red-flag words like this open the door to libel. It is astounding that The Union allowed this to run, without a comment from Lamphier or clarification of its own. Letters need to be reviewed by editors (and in some cases lawyers) and returned to the letter writer for revisions, if needed. It is standard operating procedure at major newspapers. That being said, come June, I will be casting my first vote in a California election for Mr. Dan Miller for District 3 supervisor. Context: So now the damage has been done, in this case painting Lamphier in a false light and putting him on the defensive about whether to respond or not. It is sloppy op-ed page oversight and does the community a real disservice. Editor’s note: The Union’s weekly columnist George Boardman has posted a formal “clarification” (AKA correction) on his blog for a post titled “Making a concealed weapons list, check it twice.” This has been a pattern with George’s journalism, causing considerable consternation in the community. Here’s another: Confusing the Auburn and Folsom Dams. Duh. As I said last week, The Union needs to dump George before it’s too late. The Union links to George’s blog — at its peril. Sheriff Keith Royal said earlier this week he didn’t provide a list of Nevada County residents with concealed weapons permits to The Union when the newspaper requested the information in 2004. In accordance with the law, Royal said he first notified permit holders about the paper’s request. He said he subsequently received a call from publisher Jeff Ackerman canceling The Union’s request for the information. The original post, “Making a concealed weapons list, checking it twice,” has been revised to incorporate this information. Though promising to find a “middle ground,” his blog wastes no time ridiculing my personal appearance and even my business, which unlike (The Stonehouse restaurant his family once ran) is thriving. Why so petty? Because he doesn’t have anything tangible to grab onto, so he throws rocks from the sidelines. Though The Union editor praises George’s “career in journalism,” George confesses that he spent “most of working years in corporate public relations.” (He left the word “my” out). George is already being spun by the hard right, clueless about their tsunami that is about to engulf our local political scene for the 2014 elections, including the “nonpartisan” posts (because he has no “sourcing”). You can also be sure that Ackerman has a direct pipeline to Boardman’s email “in” box, as he has in the past. George promises to report from the “center,” though he ridicules the sustainable food movement, laws to protect the transgender community and praises McClintock’s legislation. So what’s new at The Union? Nothing. Our western county politics is about as toxic as it gets. First Amendment rights are OK — as long as they are like-minded opinions. 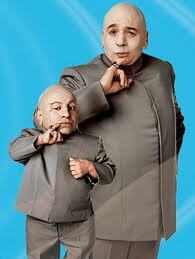 Our local newspaper bags ex-publisher “mini me” to write a weekly column — whoo hoo! Less than a few days after The Union painted our community as yahoos to the world with sloppy reporting on a “Support Our Troops” sign at a church, the editor is gleefully announcing that George Boardman — a “mini me” of our ex-publisher, in style and substance — will write a weekly column each Monday. George is a friend of Jeff Ackerman and his glory days of journalism were spent at The Union, though he might have climbed as high up the ladder as the Palo Alto Times. George’s family was involved in running The Stonehouse Restaurant in Nevada City, which closed. He also worked in PR, often considered a “cop out” for serious journalists, at least in George’s era. George lives in Lake of the Pines. When I read his columns, I regularly conclude that he should mingle more with Californians — on the Coast or at least in Sacramento or Tahoe. It’s a classic “big fish, small pond” syndrome, “all hat, no cattle,” or a guy who throws rocks from the sidelines but never has won many big games. I figure The Union brought him onboard to placate the “righty’s” of our community, who complain the new publisher is too soft compared with Ackerman. It came after a “readership survey.” On the hard-right political blogs, one reader has been speculating about another looming management shakeup. It’s a safe move too. George also is popular with the RL Crabb contingent, many “shifters” and other community old timers. They defend him wholeheartedly, like mother hens. It’s a big mistake if The Union ever expects to grow its readership — and a classic “inside the box,” “cul de sac” recruit. And to preserve what? The readership is aging and declining. You can also read George making fun of real-food author Michael Pollan when he came to town, while also belittling the sustainable food movement — even though it is gaining traction in our community. “GM crops have helped ensure food security and bolster incomes for farmers, and better GM crops are in the pipeline. Billions of people are leading longer, healthier lives since the commercialization of GM foods over 17 year ago,” he wrote. George also likes to bring up the old saw that healthier food costs more. “Duh”! as he would put it. “Organic? Eat a Big Mac and pocket the change,” he writes. George likes to make fun of our County officials, referring to their “clueless comments” but again, I’d cringe to think of him executing any county responsibilities. Talk is cheap. George makes fun of Netflix, which would have made him a bundle if he’d bought the stock instead of made fun of it. Like Ackerman, George has a chip on his shoulder and is insecure around people who are smarter or more successful than he is. Congratulations to The Union! It is starting off the new year taking a giant step back to the days of its ex-publisher. And drawing a smaller circle around itself. Author jeffpellinePosted on December 31, 2013 January 3, 2014 Tags George Boardman, grass valley, Jeff Ackerman, The Union5 Comments on Our local newspaper bags ex-publisher “mini me” to write a weekly column — whoo hoo! The Union’s Freedom of Information Act lawsuit has cost our schools about $17,000 to defend, and the money will come out of the Nevada Joint Union High School District’s general operating budget to pay for it, Sierra Foothills Report has learned. We calculated the legal tab from our own FOI request, and Karen Suenram, assistant superintendent of business services at NJUSHD, confirmed that the fees will come out of the district’s general coffers. Earlier this month, Sierra Foothills Report sent a public records request to the Nevada Joint Union High School District to find out what The Union’s recent FOI lawsuit against the District cost our schools — at a time of tight school budgets and cutbacks. The Union lost the suit, as previously reported. We felt the FOI suit was misguided, because there was no “smoking gun” documents in the termination of Superintendent Marianne Cartan’s contract, just an honest professional disagreement about performance. It happens. A judge agreed with the District’s position. The incident cast a light on The Union’s lack of sourcing in its beat reporting more than anything else. Now the financial consequences — a $17,000 legal bill for our schools — are surfacing. Our FOI request turned up the legal tab in detailed invoices: one for $14,790.76 in June and other for $2,100.46 in May for a grand total of $16,891. We suspect our own FOI request will add some cost to the total as well and apologize for that. (We’ll match our cost with a donation to a high-school fundraiser, we told Suenram). Atkinson, Andelson, Loya, Ruud & Romo, from Fresno, who handled the FOI case, are billing at the rate of $175 an hour — a reasonable enough rate. The case sucked up almost 100 hours in legal time. We’re not surprised. Case research gobbled up most of the time.